I realized that this wallpaper kind of fits Valentine's Day and could have planned to release it on that day. Too bad I don't care about that day (single ftw mf) and decided to work at my pace. Swoot. Patience paid off and nothing was rushed. I found this scan randomly browsing in AP's gallery. Basically I click on random artist names and hoped for some epic art. I fell in 'olev' with this scan. 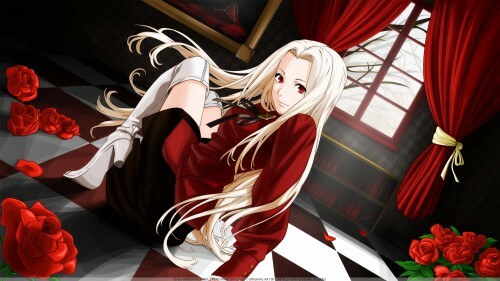 The character is Irisviel von Einzbern from Fate/Zero. She is Illyasviel's mother. The beauty of the muddy scan grabbed me by the balls and screamed, "BRING ME TO LIFE!" Then I went, "awwww-right." Thus the journey began. I started working on it around the beginning of January at snail's pace. I slowly did the line work. After that there was a 3-4 week period where I didn't do jack. I sat down and tried to see what I could add to the wall. Just staring at the line work and base colors. Curtains were pretty much X'd out from the beginning. I sketched new ones and additional objects. I got rid of the NASTY column on the left side later on. The emptiness was bothering me but the column bothered me more. There was a plan to add Excalibur sheathed in Avalon but wasn't sure if it was worth it. So I just left it blank so the wall retains its wide feeling instead of being framed. The past week is when I really started on the wallpaper. So maybe 1-2 weeks working on this wallpaper. Every wallpaper since I came back has been a landmark for me. This wallpaper is no different. I know my weakness is in backgrounds so I decided to work in reverse. I completely vexeled the background because the main reason for sloppy/weak backgrounds is that I am burned out after doing the character. I also worked on the wallpaper as a whole. I didn't render the character at x2 resolution but at the usable resolution so I don't think I'll release a character vector. There were some new things I wanted to try out. I always wanted to do tiles. So tiles EVERYWHERE! Then I also wanted to do roses. At first I wanted to litter the floor with roses but it would have been too much (to do). I kind of like how the roses turned out. Zoomed out they looked like fresh fleshy flamboyant fixated hearts served on a bowl of greens ready to be completely devoured by an overwhelming predator. I would have liked them to look softer with some transparency since their petals are thin, silky and light is hitting it. But... I didn't want to figure out how to do it and I liked how bold they looked. My last wallpaper had vexeling that was more abstract. This time I wanted to do it cleaner and more visibly tiered. I also did a small painting in the frame instead of vexeling something. It was lots of fun. It's a wine glass spilling endless blood everywhere. I almost went overboard because I wanted to paint it spilling out of the frame on to the floor. You could look at as symbolic of the holy grail where you needed to use the body of someone as a catalyst to call it. It's been a while since I watched F/SN so I could be wrong haha. Anyway, enjoy! All resolutions available at AP and some below. Check out how neat the vectoring is; the details on the curtains and the painting are awesome. The lighting is also fabulous, particularly on the roses. Proposed by Kitaan and highlighted by Chloe. Browse Yuusuke Kozaki Gallery: Recent | Popular. Lol, I spend a good 5 mins staring thinking of words. not going to be said in a few more hours. Though anyways, I think you've improved wonderfully with this wall. also I really love that you added to the BG and changed things up. her shining light so I'm thinking she should be darker, have a few more shadows on her. Overall this is definitely worth a full view, very very beautiful work. how awesome. this is just pretty! please make more wallpaper like this, it's AMAZING ARTWORK. amazing! *-* this wall is so beautiful, and the vexeling is really great! Absolutely gorgeous. I just love how vivid the red is, especially on the roses. Beautiful work on everything, especially the character vector. Nice! I like the colors, and the way you did the shading/shadows. Awesome, the resolution matched my laptop's screen perfectly, and the red colors are just lovely. Though not much of a red color theme fan, but this is wonderful ^_^. im really looking forward from your future works! and OMG. there's so many details! maybe ill die if i make details such like that! Yay for 16:9! 8d I can use it on my new monitor!